Free your Photon from its USB cable by powering it through the Photon Battery Shield. 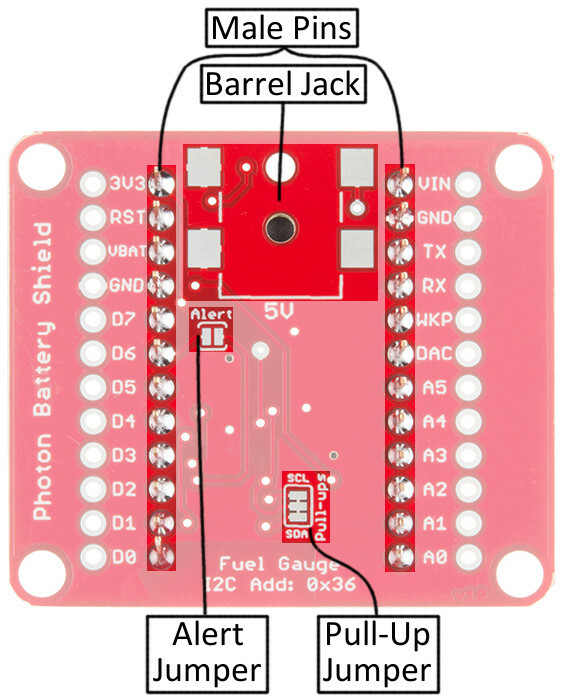 The Battery Shield has everything your Photon needs to run off, charge, and monitor a LiPo battery. The Shield features two unique IC's: an MCP73831 charge controller and a MAX17043 LiPo fuel gauge. With them, you'll be able to charge your battery through USB and monitor its voltage and state-of-charge. 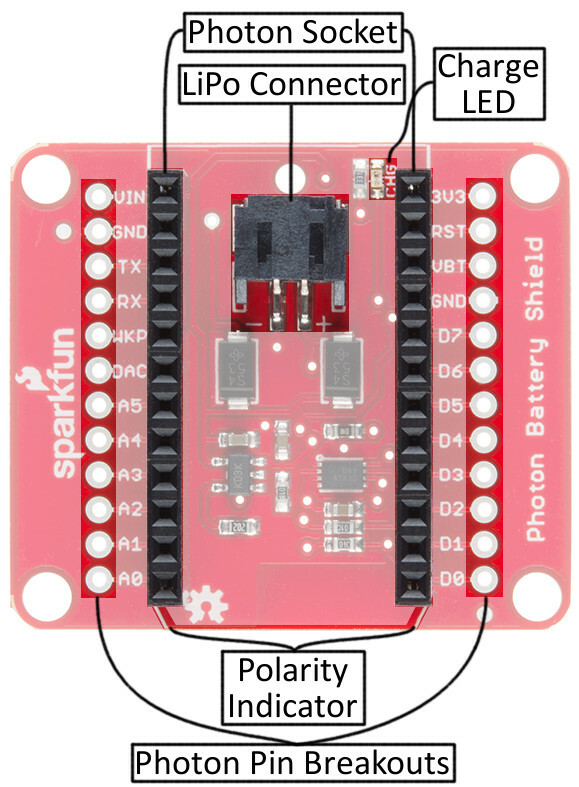 Please Note: All SparkFun shields for the Photon are also compatible with the Core from Particle. The WKP, DAC and VBT pins on the Photon will be labeled A7, A6 and 3V3*, respectively, on the Core, but will not alter the functionality of any of the Shields. Battery Shield Overview -- A quick overview of the components and features of the Photon Battery Shield. Using and Charging a LiPo Battery -- Some tips and tricks for running off, and charging a LiPo battery with the Shield. 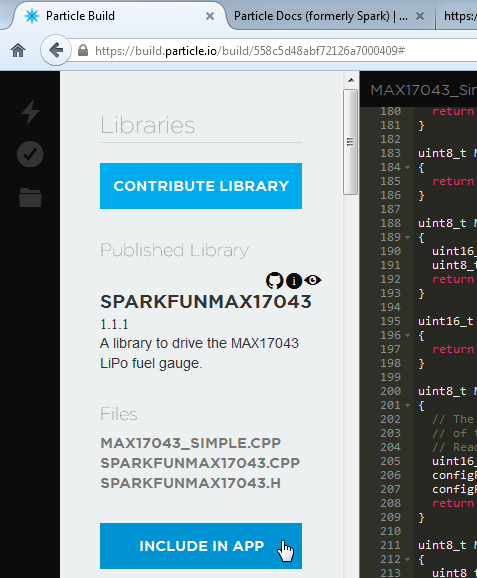 Using the MAX17043 LiPo Fuel Gauge -- Example code -- including a Particle library -- demonstrating how to read the voltage and state-of-charge outputs, plus other features of the MAX17043 IC. The Photon Battery Shield equips your Photon with just about everything it should need to use a LiPo battery -- it even includes headers! Of course you'll need the Battery Shield and a Photon. If you want to use a battery of your own, just make sure it's a single-cell (3.7V nominal, ~4.2V max) lithium-polymer (LiPo) or lithium-ion (Li+). Optimally, choose one that is terminated with a 2-pin PH-series JST connector, otherwise you may need to do some wire splicing. If you don't already have one (or just want to stock up), you may also need a Micro-B USB Cable, which will come in handy when you need to recharge the battery. If you don't want to plug that cable into a computer, a USB Wall Charger is useful to have on hand. How to Power a Project -- Hopefully you've already figured this out, since you're reading a Battery Shield tutorial. This tutorial does have an enlightening section on battery power. Battery Technologies -- Specifically, check out the section on Lithium Polymer batteries. How Lithium Polymer Batteries are Made -- Learn everything you always wanted to know about what goes on behind the scenes at a battery factory. I2C Communication -- I2C is a popular low-level, two-wire communication standard. This is what we'll use to communicate with the MAX17043 fuel gauge IC. LiPo Connector (PH-Series JST) -- The battery goes here. This connector is polarized, so it'll only plug in the right way. Photon Socket -- Each Photon comes pre-soldered with male headers, so all of our shields come pre-populated with female connectors on their top-side. 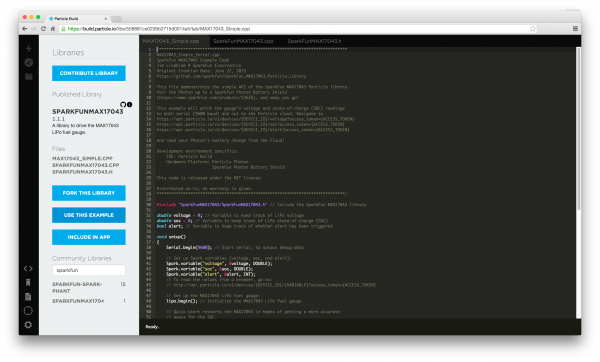 Photon Pin Breakouts -- Need more access to the Photon's I/O? These pin break-outs have that covered. These break outs are in the same place on each of our Photon Shields -- should you need to interface them together that way. Photon Polarity Indicator -- Nothing's going to work if your Photon isn't plugged in correctly. These angled edges should match up to those on the Photon's PCB. Charge LED Indicator -- This red LED will light up whenever the LiPo battery is being charged. 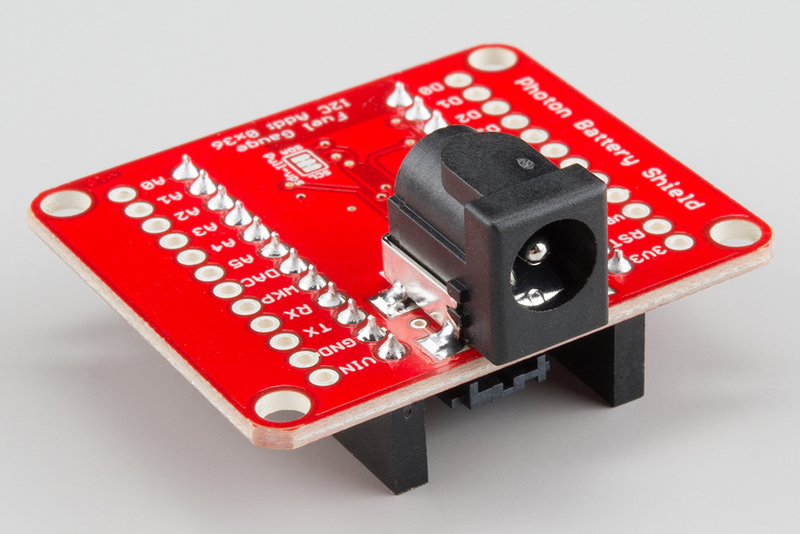 "Stackable" Male Pins -- Whether you want to plug the battery shield into more Photon shields, or use it in a breadboard, these male pins should do the job. If you don't need this feature, the pins can all be quickly beheaded by some flush cutters. SMD Barrel Jack footprint -- This footprint allows you to add an SMD Barrel Jack to the Battery Shield's underside. This'll allow you to charge the battery with a 5V Wall Adapter, or even a Small Solar Panel. 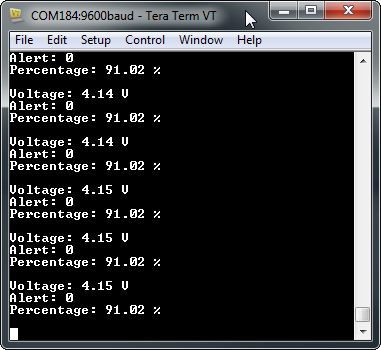 Just make sure your power source isn't higher than 5.5V. I2C Pull-up Resistor Enable/Disable -- The Photon Battery Shield includes a pair of 10kΩ pull-up resistors on the SDA and SCL lines (D0 and D1). If you've got more I2C devices to connect, you may need to disable those. These jumpers are closed by default, but can be opened with a couple slices of a hobby knife. Alert Interrupt Jumper -- The MAX17043 features a programmable interrupt output, which can fire whenever your battery gets below a set percentage of charge. This pin can be connected to the Photon's D6 pin by adding a blob of solder between these two pads. Note that this jumper is open by default, as other shields make use of D6. 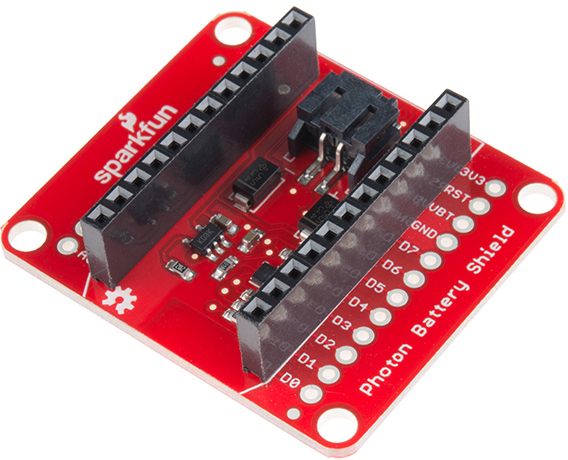 Before plugging your battery in, grab your Photon, and plug it into the battery shield. Make sure you line up the Photon's angled edges with the matching white silkscreen on the shield. The Photon's USB connector should be pointing out the same direction as the black JST connector. Next, grab your LiPo battery and mate its white JST connector with the black one on the shield. These connectors are polarized, so you can only plug it in the right way. 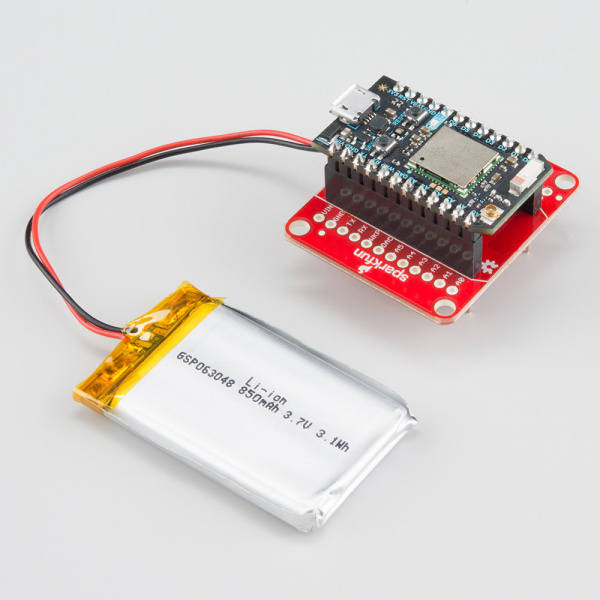 Running your Photon off a LiPo is as simple as plugging in a battery and the Photon. If the battery had any charge, your Photon should turn on, and its RGB LED should begin being colorful. If it was already commissioned, your Photon should connect to your WiFi network. 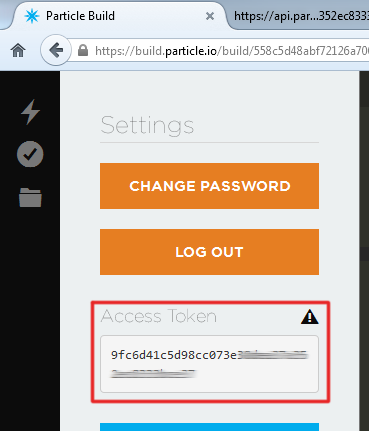 You can even load up the Particle Build IDE and truly start loading code over-the-air. Eventually your LiPo's power capacity will be drained, and it'll be time to charge it back up. To avoid any extra USB connectors, the Photon Battery Shield was designed to use the Photon's USB connector as a charge-source. 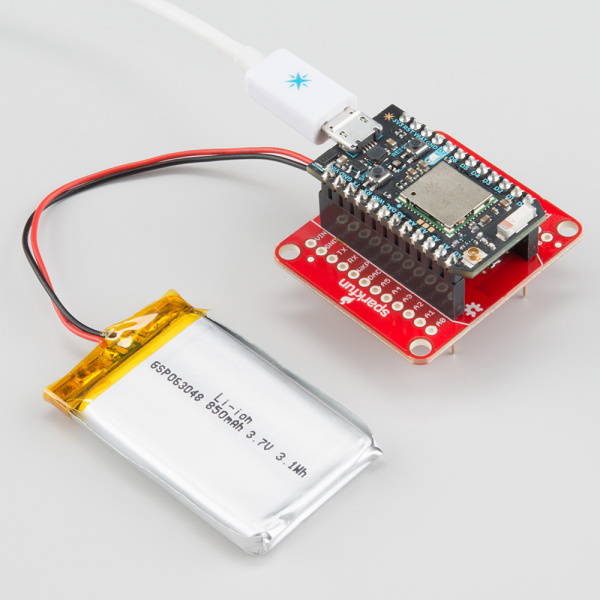 With the LiPo and Photon still connected to the Battery Shield, simply plug a Micro-B USB cable into your Photon (the other end of the USB cable can be plugged into a computer or USB wall adapter). To charge the LiPo, just plug a USB cable into the Photon's USB port. Once USB is attached, the red charge LED indicator should illuminate -- it'll remain lit up until the battery is fully charged. The Battery Shield provides additional options for charging your LiPo in an unpopulated barrel jack footprint. If you need to charge the LiPo sans-Photon, this may be the best option for you. To add this feature, you'll need our Surface-Mount Barrel Jack, and some soldering tools. If you're a novice solderer, don't be scared off by the "SMD" soldering -- these joints are about as easy as it gets. Check out or soldering tutorial for some guidance. To charge a LiPo through this jack, you'll need a 5V power source -- our 5V Wall Adapter should do the trick. 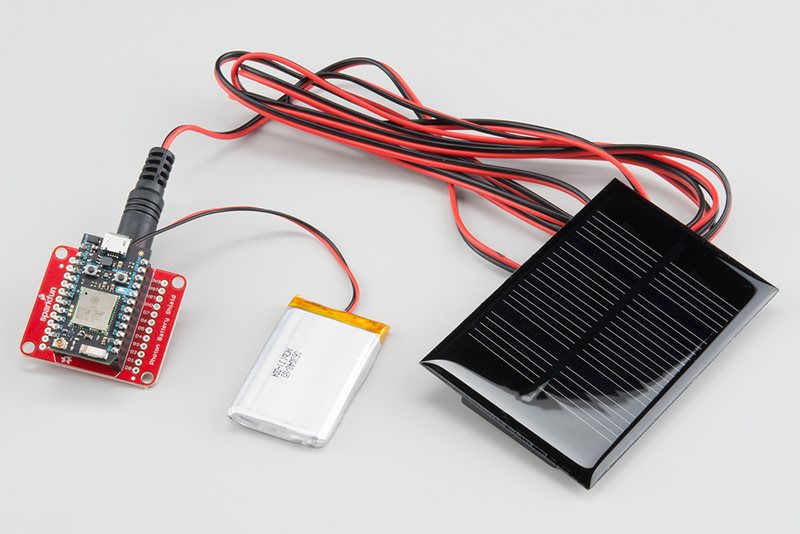 Or, if you really want to avoid wires, you can use our small, 0.45W solar panel, which will source up to 5V when it's nice and sunny. If you don't want to solder the barrel jack on, but still have a 5V power source available, you can supply that voltage to the "VIN" and "GND" pins on the shield's header. This is a more advanced charge technique, and only recommended for more experienced users. 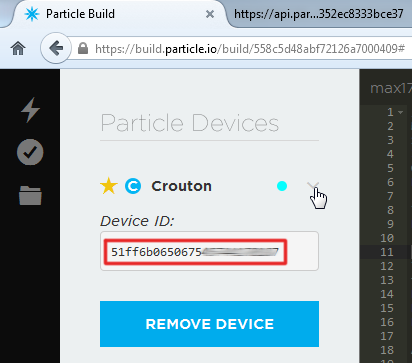 Particle Community Forum -- anything that you couldn't find in the docs should be easily found in the community forum. If you are having trouble, search this forum first, as many of the answers are there already. Photon System Modes - Playing with different modes allows you to have control over when the Photon is and isn't connected to the web. Photon System Sleep Function - The sleep function puts the Photon to sleep while it isn't performing any actions to conserve power.